IPhone, pathetic but would be lost without it. Estee Lauder powder compact and YSL powder brush - for those unexpected shiny moments. Collection 'No Clumps' mascara - just amazing for a touch up on the go. My favourite teal eyeliner - Soap & Glory - Smoulder Kohl, handy for unexpected cocktails with the girls. Eyelash Glue - for those flyaway falsies. Hair Bobbles - wouldn't be without one or two at hand. Bee Good Vanilla & Honey Lip Balm - without a doubt the best lip balm I have ever used. Benefit Fine One One - brightening colour for lips and cheeks. MAC Brave Red Lipstick and Chanel Rouge Allure #207 Famous - because a girl can never carry enough red lipstick! We then have O.P.I Avoplex - Cuitcle Oil To Go - for super soft cuticles, all day, on the go!! To keep my blood sugar from dropping I always carry a banana and I'm loving these Pineapple flavour infused Raisins by Nakd. Last up I have some spare change, My File & Polish reward card for my fortnightly dose of Shellac and a YO! Sushi share your experience flyer. I am often found there on a Thursday after late night shopping. Almost for got - Boots receipt, need to have points added to my card. Oh yeah and my bag is from Accessorize - you can buy it in pink here. I love posts like this, I am so nosey aha :) Those pineapple infused raisins sound SO yummy. Have you tried the Cola infused ones, they are surprisingly tasty too!! They are so fab, agreed! Thanks honey it is super duper soft. 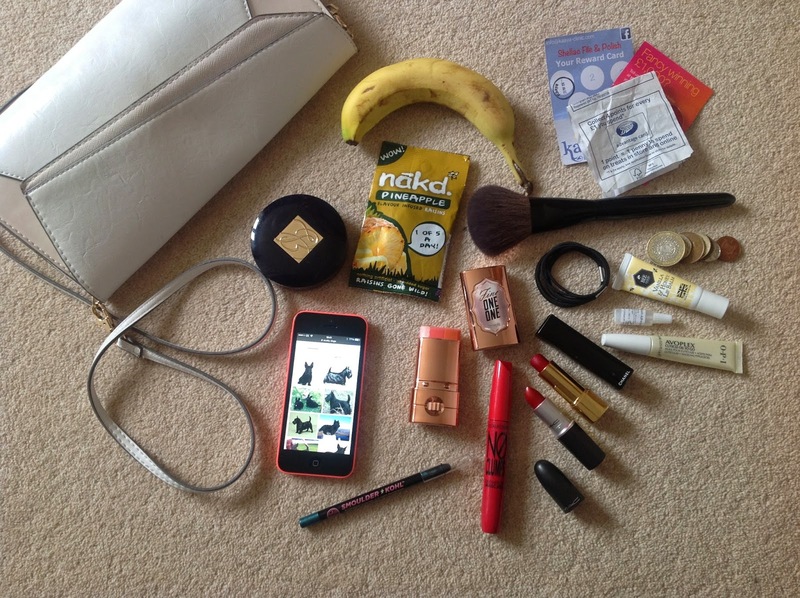 Great post & I absolutely always have that many lip products in my bag too, its an issue! Hey gorgeous i know, i can't help myself, I usually have some glosses thrown in there too!! Great choices. I love the Mac lipsticks! Your blog is really adorable the little Scottish Terrier on your header is so cute. Aw thanks lovely.. I love Scotty Dogs they are one of my favourite things.. I really do want to try the Benefit Fine One, it looks like a lovely set of shades for your complexion. I love looking at people's bags. I took a double-take when I saw the banana. Mm pineapple raisins?! Just followed you lovely, great post!